All prices below are in USD and are subject to change without notice. Texas State Sales Tax of 8.25% will be applied automatically to all orders from clients who are located in Texas. Early Bird Price Discounts are typically offered for all Semi-Custom Holiday eCard orders through our website until October 1. Normal rates are applied to orders placed after October 1. Our production schedule fills quickly during the busy holiday season so we recommend placing your order with us as early as possible to secure your spot on our limited holiday e-card production schedule. Note: If you need your project turned around quickly, we do offer RUSH service for an additional fee for beta delivered within 48 hours of receiving the order and all assets from client. Client Host: If you prefer and are capable of hosting your own final eCard files, please contact us to discuss the specifications and pricing. Contact Us with any questions about customization or hosting. *Clients who reside in Texas will be charged sales tax at 8.25% during checkout.All prices subject to change without notice. No WebbyCards logo or branding will be included in the eCard. Only WebbyCards copyright info will be displayed discretely on the html holding page. Base Fee includes up to 2 rounds of revisions/adjustments after initial beta version is delivered to Client. Additional rounds of change requests may require an additional fee. WebbyCards can create fully custom e-cards in any preferred style for any occasion including Thanksgiving, Christmas, New Years, Memorial Day, Independence Day, Labor Day, Veteran's Day, Corporate Birthdays, Anniversaries, Event Invitations and more. We can also bring your own design to life with animation services if you already have a design created. Contact us with your project requirements and we can provide you with an estimate for your project. For Quicker Turnaround Service Required within 48 hours for semi-custom electronic holiday greeting card orders. Any change requests will be made within 24 business hours. Replace current song in selected eCard with a new song provided by client in .mp3 format. Fee includes any editing time needed. We can change the current music with any song from our current music library for no additional charge. This option is available for any of our eCards which currently include photos in them. If you would like to replace the current photos used in the e-card with new photos, please select this option. Client to provide new images in .jpg format. Please contact us with any questions. If you need an additional page/screen added to the animated e-card we can add a new page to the e-card at the opening, middle or at the end. If you need a clickable link within the animated e-card we can include a clickable page at the end of the e-card animation to link to 1 designated url. Contact us for more information. If you would prefer that your animated e-card open up out of an envelope, we can add an envelope opening animation to the beginning of the e-card of your choice. Includes your choice of logo, sentiment, and/or custom stamp on the envelope. A custom envelope can be created for an additional fee upon request. Distribution fee includes cleaning up the e-mail distribution list using Neverbounce to remove any invalid e-mails, formatting and importing of valid email recipients to our system, HTML e-mail template, access to e-mail tracking info (emails sent and read) and distribution on the Client's designated delivery date once the eCard has been approved. Distribution fee is based on 1 master list of up to 10,000 recipients. If additional lists or alternate senders are needed, please contact us for more info. Note: We do not share any of our client's e-mail lists or addresses with anyone. Our system can send professionally designed eCards automatically to your employees, customers, colleagues or friends to show your appreciation on their birthdays, anniversaries, or other key dates. May include alternate message, different logo, or include alternate signatures. Ideal for customers who need to send the eCards from different departments, internal and external distribution versions or from an alternate sender. Additional versions in other target languages (i.e. Spanish, French, Chinese, etc) are available for an additional fee. Client to supply all translated copy. 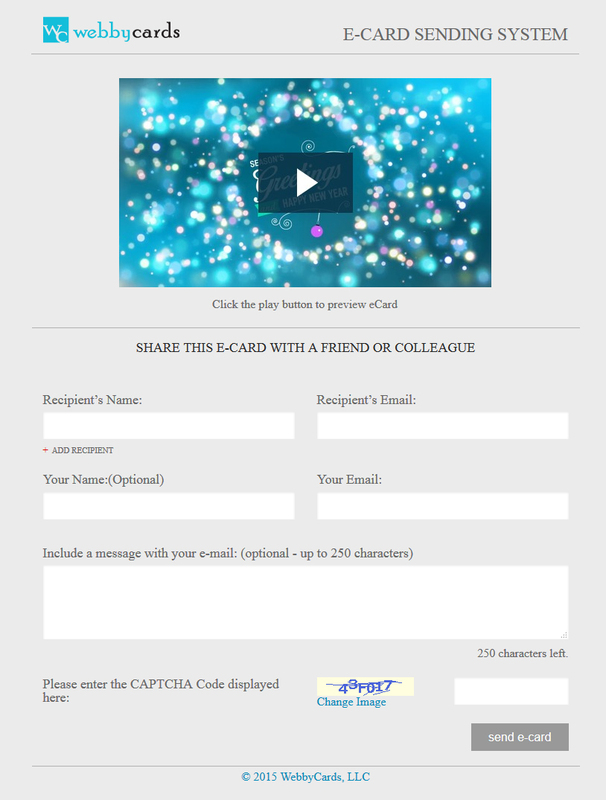 Ideal for clients who have a smaller distribution list or would like to provide employees or reps with access to a personalized e-card sending portal to easily share your customized e-card with up to 10 recipients at a time. We will create a company branded e-card sending portal including a login page (1 unique username and password provided) and client branded eCard sending page to allow those you provide access to the portal to send the e-card with a personal message included in the body of the e-mail with a thumbnail image of the e-card and link to view the e-card in the user's default browser. Contact us for login access to view the demo or if you have any questions. Alternate Language Versions, Alternate eCard File/Player formats, eCard Design for Printed Cards, More Advanced Customization & Rebranding, and more. Most of our semi-custom eCards are very flexible in how they can be modified to fit the client's preferences and needs. Contact us with any questions. Don't need an animated eCard? View our current Non-Animated Corporate Holiday eCards in our catalog here >>. We can create a non-animated eCard version from any of the base eCard designs from our catalog with Client's message, logo and any other customization needed. If you prefer a fully custom designed non-animated eCard for your e-mail, please Contact Us with your project requirements for an estimate. WebbyCards can create fully custom e-cards in any preferred style for any occasion. We can also bring your own design to life with animation services if you already have a design ready. Contact us with your requirements and we can provide you with an estimate for your project. All major credit cards are accepted through our website for our Semi-Custom eCard orders from our catalog (Visa, Mastercard, Discover and AMEX), PayPal or provide a Purchase Order # if a check or wire transfer is the preferred method of payment. International Customers who would like to pay by credit card must choose the 'Check out with PayPal' option or provide a purchase order # if an alternate method of payment is preferred. Contact Us with any questions.